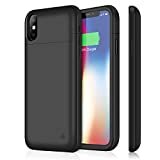 The 5,200 mAh battery inside the iPosible 5200mAh Slim iPhone X Battery Case is nearly twice the size of the 2,716 mAh battery in the iPhone X, which means you’ll get almost triple the battery life using this awesome accessory. It’s surprisingly slim when you consider how big the battery is inside, and it’s also insanely cheap at just $19.95. This Amazon sale isn’t going to last very long though, so definitely grab one while you can. 【MORE POWER】Effectively provide 150% extra battery life to your iPhone X.Equivalent to add 31 + hours talk time or 90+ hours for music and 19+ hours for video and built –in Magnetic Metal.. Sync & charge your iPhone X to your Macbook, PC or laptop without removing the battery case. 100% compatible with all iOS versions, and future iOS software updates(Apple CarPlay is not supported). 【PROTECT】The iPhone X Battery Case Charger design Protecting and Charging 2in 1 makes sure that your phone will be protected from drops and impacts. The batteries use Grade A+ batteries with CE and RoHS certification. Internal chips also protect your smart phone from overheating, short-circuiting, over charging, and discharging. 【CHARGING】Charge your iPhone X and battery case both,When you plug the lightning cable(NOT included) to battery case with your phone, it will charge the phone to 100% at first, then transfer it to charger the battery case to 100%, once battery case arrive 100%, it return back to charge your phone again. 【4 LEVEL LED】Featuring with the LED battery level indicator, this battery case could let you know exactly the power left (0–25%–50%–75%–100%); besides, you could switch on/off your iPhone X battery case with the power switch easily. 【24 MONTH WARRANTY】Customer satisfaction is our #1 priority. If you are not 100% satisfied with your purchase, just let us know. we can help with any issues that you may have.